You'll be £18.00 closer to your next £10.00 credit when you purchase The British Overseas Airways Corporation. What's this? 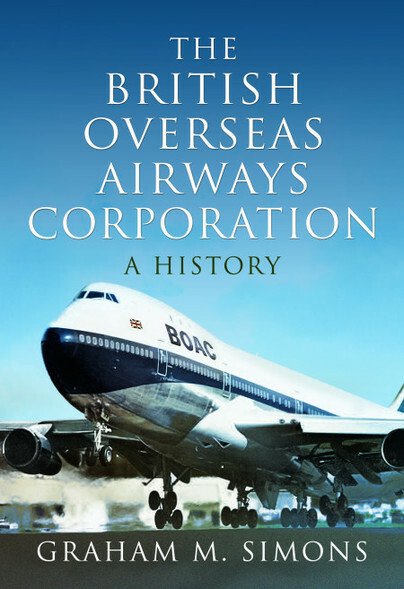 Graham Simons presents us here with a colourful, thoroughly engrossing, well-researched and highly illustrated history of The British Overseas Airways Company, from its origin in 1940 to its closure in 1974. The scope of the book takes in the history of the Second World War, examining the ways in which this conflict shaped the development of the airline. BOAC kept wartime Britain connected with its colonies and the allied world, often under enemy fire, and initially with desperate shortages of long-range aircraft. It played an important role in the transportation of passengers during an incredibly fraught and dangerous era. Post-war, jets were brought into the mix and aircraft types such as the de Havilland Comet saw employment. In the 1970s, an Act of Parliament saw BOAC merged with BEA, with effect from 31 March 1974, forming today's British Airways. But the era of The British Overseas Airways Company marked an important bridge between wartime services and the contemporary operations that we recognise today as being part of British Airways' day-to-day working practices. The era 1940-1974 saw a great deal of development change the face of flight in a variety of contexts. By choosing to record the history of BOAC, Graham M. Simons is confronting an era of ongoing interest to students of aviation and historians of mid-Twentieth century history. The book is very comprehensively illustrated... hotos of aircraft, in-house publications, brochures, travel posters and more paint a rich picture. Appended are all sorts of useful data, from BOAC chairmen and board members to British PMs and Civil Aviation Ministers; and aircraft classes, names, and call signs; and that all-important list of abbreviations used and a bibliography too. As the blurb says, similar in style to the author's Comet book. Both books are colourful, comprehensive and read very well. I particularly like the reproduced publicity material. This, alongside Scoval Publishing's Pictorial History, are the best BOAC books out there! BOAC was one of the biggest airlines in the years after the second world war, and Graham Simons’ history of the airline, complete with historic, brilliant photographs and illustrations, reminds us of a world that was growing smaller for some people, and being made accessible by this fantastic airline. A superb slice of nostalgic history. This book is packed full of archive images for important events, aircraft and the airline’s operations. It includes images of promotional material and incredibly well-researched detail in an easy-to-read style. is highly illustrated with a fascinating selection of images , many of which are rare and will be seen for the first time in a modern review of a national flag carrier. This volume is well-researched and written and as such is likely to have wide appeal to aviation enthusiasts of all persuasions, especially those with an interest in the airline itself. Aviation historians, together with military and social historians with an interest in such matters may also find it worthy of their attention, while former BOAC staff may find it interesting (and perhaps amusing) as an aide memoir when recalling ‘the things that happened’ while in the airline’s employ. English professional aviation writer, publisher and historian Graham M Simons is one of the founders of the world famous aviation museum at Duxford near Cambridge where his interest was piqued watching the making of the ‘Battle of Britain’ film there in the late 1960’s and from the days when you could go ‘aircraft spotting’ at London Heathrow and other airports. From this, and with an engineering background, he progressed to membership of a number of aviation societies, including sitting on the British Aviation Preservation Council, eventually taking the position of Engineering Director with one group. Here he was responsible for overseeing the restoration of a De Havilland DH89 Dragon Rapide airliner to flying condition and placing this aircraft - with official approval — in the colours and markings of the first aircraft of what was then the Kings Flight. It was during this period that he was contacted by Ian Allen Ltd to write the first ever history of this classic De Havilland type. Other titles rapidly followed and with a growing number of contacts in both the military and airliners, Graham turned professional in 1987, combining his love of writing with his skills in production to create and publish aviation histories focussed on a variety of subjects. He is the author of Howard Hughes and the Spruce Goose, Comet! The World’s First Jet Airliner, The Airbus A380: A History, and De Havilland Enterprises: A History, amongst many others published by Pen and Sword Books.